News and updates for what TECHNOCRAT GAMES is currently up to. Hope you remembered to vote in today's European elections! Unless you're not from Europe, in which case, good for you. Amongst all the woodwork that I'm doing for my upcoming wedding, I'm still finding time to work on a little game called "Technobabylon", which is chugging along nicely, and now has seven of the 11 sections of gameplay completed. 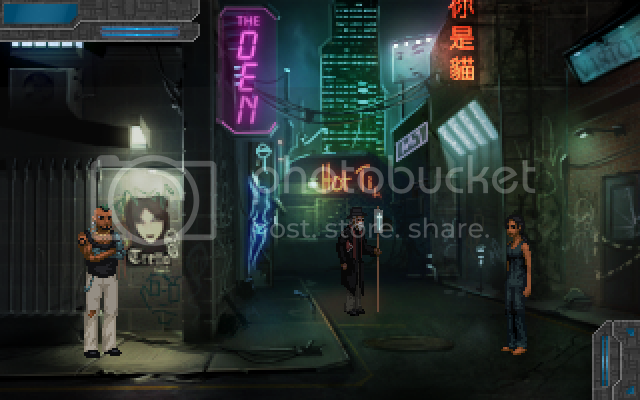 With generous spoonfuls of neon (yes yes, I know it's a noble gas and as such would float away), what is possible the most cyberpunk scene in the game is being engineered for Latha's third section, in which she explores the city's seedy underbelly - both physical and virtual - in order to find some clues about who has been trying to kill her. With all this in mind, it looks like the game's going to be completable, beginning to end, by July. After that, it's just a matter of giving it sound, and putting MORE STORY in there, so that players won't have to keep referring to the development document. Come to think of it, the dev document is now out of date, as well. Ah well. If you're playing this game, and you're me, then you'll understand the story. It'll be fine.